WHAT (TECHNOLOGY): Nginx is an open-source, high-performance web server that is designed to serve static content quickly and provide accelerated proxying capabilities to application servers, which run things like Python, Ruby and PHP. Nginx uses an event-driven, therefore asynchronous, approach to handling requests, and it also has a very efficient reverse-proxy caching layer. A master process is responsible for configuring tasks and launches a number of single-threaded worker processes. In turn, each worker is then capable of handling many simultaneous requests. Event-driven servers are lightweight compared to servers like Apache that use a process or thread per request because of the overhead of using more and heavier threads. Performance does not drop when Nginx has thousands or more concurrent connections because having only a few small and efficient workers doesn’t require as much RAM. Also the server does not have to waste time switching threads. Nginx is available for Linux, FreeBSD, Solaris and Windows. Note: many sites deploy Nginx with Apache. WHAT (COMPANY): Nginx the company intends to improve support and documentation as well as introduce new features and speed up patches and fixes. LAUNCHERS: Igor Sysoev started developing Nginx in 2002 while working at Russian search engine Rambler and released the code in 2004. Other founders are Andrey Alexeev, who was director of the IP service network at Russian mobile operator MTS/Comstar, and Maxim Konovalov, previously CTO of Rambler. WHY: Millions of sites use Nginx (see top ones here), but there’s been no official support since its launch. Companies built on open-source projects can implement improvements and features faster. WHEN/WHERE: Announcement was July 18 / Russia. No date for company launch. BUSINESS MODEL: Not discussing, but clearly the company will sell support services much as Red Hat does for Linux. 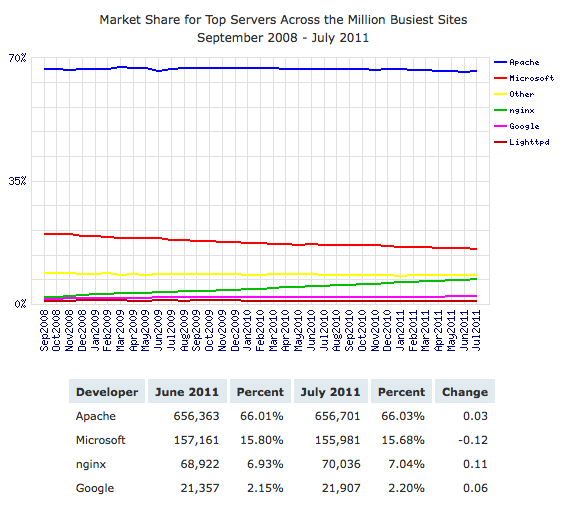 COMPETITION: Web server space generally: Apache, Microsoft and Google. Lightweight servers (similar to Nginx): Lighttpd, Cherokee and thttpd. CUSTOMERS/GROWTH: As of July 2011, Nginx has about 6.5% of the web server market and 23M sites according to Netcraft (see below). Its market share has nearly doubled from about 3.4% in July 2009 while market-leader Apache has remained steady with just under 67% during the same two-year period. A DEVELOPER WHO USES NGINX SAYS: Mark Jaquith is the lead developer of WordPress (open source) and an independent web publishing consultant. Having used Nginx for a few years, he hopes Igor will indeed have more time and resources for the project. WHO BACKED IT: No outside investment as yet. “Any and all funding has been from our own resources,” says Andrey, who would not disclose the amount. LAUNCH asked Mark a series of questions via email -- here are his unedited responses. LAUNCH: Briefly describe your experience with Nginx. Mark Jaquith: I've been using nginx for a few years. I had a client whose server was getting pounded. I determined that over 75% of requests were for static files like images. Apache, although excellent and flexible, was struggling trying to serve both pages and static files. It was a "jack of all trades, master of none" situation. I put nginx in front of Apache on a separate machine, and started serving media files directly from nginx. Things got a lot faster. I did some load testing, requesting an image tens of thousands of times with a hundred concurrent connections. It averaged 11,000 requests per second, using 8MB of RAM, and with server load at a miniscule 0.02. I was a convert. I now routinely deploy it in conjunction with Apache, and have toyed with dropping Apache completely for some projects. LAUNCH: With Igor Sysoev creating a company around Nginx, what will that mean for the technology? MJ: Hopefully it will mean he has more time and resources to devote to the project, and to keep it focused on its goal being of a powerful, lightweight server. I think the pattern of open source projects forming a services and support company around the project is an excellent model. He just has to make sure that the project can retain its own identity and not be completely subsumed into the company. Open source is partly about longevity — always having a path forward. Spinoff companies have to respect that the source project may very well outlive the company, and it should be treated with respect. LAUNCH: What has been the most effective way to deal with Nginx issues and bugs? MJ: I've honestly not encountered many. Nginx doesn't try to do everything, and it is very good at the things it does do. It leaves a lot of extra functions to external modules. It's very much like our design philosophy with WordPress: capable core, expandable architecture, but perhaps even more disciplined. LAUNCH: Has WordPress always used Nginx? If yes -- why? If not, what did the company use previously and why did it switch? MJ: The WordPress.org and WordPress.com sites haven't always used nginx. Part of the reason for the switch was a desire for an all-open-source stack. The WordPress.org developers as well as the people at Automattic feel pretty strongly about open source software. Nginx started to really come into its own a few years ago, and now it plays a part in both the WordPress.org and WordPress.com systems.